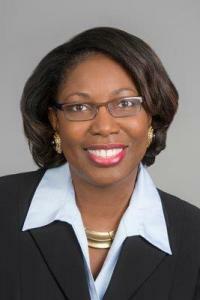 Washington, D.C. – The League of Women Voters of the United States (LWVUS) announced today that Wylecia Wiggs Harris has been named as its new executive director. Dr. Harris brings to the League many years of seasoned leadership experience, a passion for organizational development and a commitment to excellence. As executive director, Dr. Harris will be building on strategies and relationships that advance some of the most foundational political principles of our nation. Dr. Harris comes to the League after 11 years at the American Nurses Association Enterprise serving as chief operating officer for the American Nurses Association (ANA), the American Nurses Credentialing Center (ANCC) and the American Nurses Foundation (ANF), and previously as chief of staff/special projects officer for the ANA. Among her most significant achievements at the ANA were the transformation of the association’s Race for Relevance, the launch of the Leadership Institute and the reorganization of the American Nurses Foundation. With more than 25 years of diverse association experience, Dr. Harris brings strong relationship management skills and a proven track record in successfully building and establishing organizations by providing leadership and vision for staff, volunteers and members. “This position with the League of Women Voters means a great deal to me. It provides me with an opportunity to devote my leadership experiences to an organization whose mission closely aligns with my personal convictions. The League’s efforts to engage all voters has always been professionally inspiring to my work,” said Dr. Harris. Dr. Harris’s many executive achievements include serving as the executive director for both the Center for American Nurses and Sister to Sister – Everyone Has a Heart Foundation, a national organization supporting women’s health issues and heart disease education. She also served for 17 years with the American Heart Association in positions at the local, regional and national levels. In these roles, Dr. Harris used technology, communication and innovative approaches as the backbone for building or rebuilding successful educational and outreach programs. Dr. Harris is an active member of many professional organizations and boards, including the American Society of Association Executives (ASAE) and the advisory committee of Capella University’s School of Public Health. Dr. Harris has authored columns for national publications, including American Nurse Today, ASAE Journal and The Nonprofit Quarterly. Dr. Harris holds a PhD in organizational development from Capella University in Minneapolis, Minnesota; a master of management degree from Northwestern University in Evanston, Illinois; and a bachelor’s degree from Wittenberg University in Springfield, Ohio. Contact: Kelly Ceballos, 202-263-1331, kceballos@lwv.org.